The afternoon sun shone and the welcome was warm by both the Head Boy and Head Girl at the front door. The children waited patiently in the Junior and Senior common rooms excited to have an opportunity to showcase their fantastic school. Otto and Elle ensured all grandparents and godparents met up with their respective grandchild or godchild and arranged escorts for those needing to go to Pre-Prep. commented “it was the best yet” and we could not have agreed more. Well done, to all involved in making this such a success, including those behind the scenes who prepared the outstanding patisserie selection, the grounds and buildings, and to the true stars, the children themselves who were amazing. 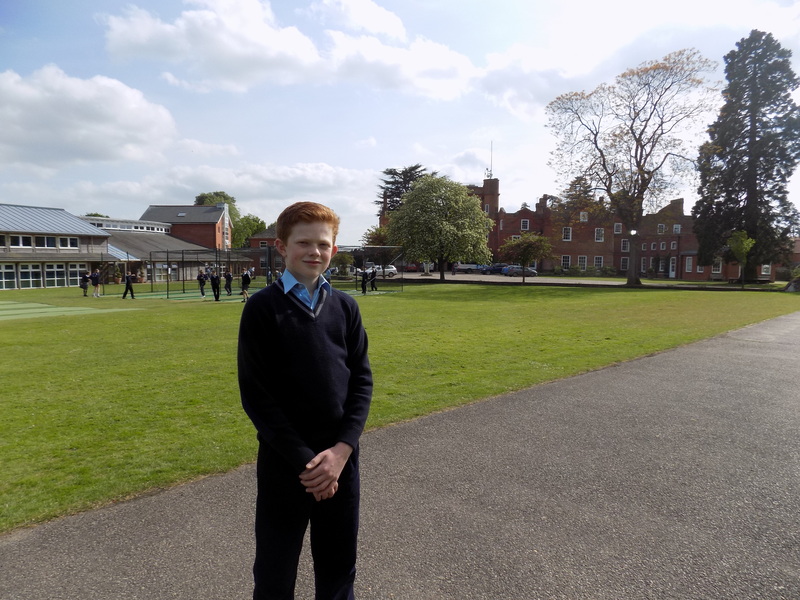 Oliver Stanton has been awarded an Academic Scholarship to Oundle School. This is a fantastic achievement for Oliver and is a tremendous award for all of his hard work over the last 12 months. Year 7 girls were lucky this week as they were able to enjoy a fun-filled pizza and cupcake night. During Monday and Tuesday evening the girls became chefs, which saw them kneading and rolling dough into any shape they desired with a splatter of sauce followed by their favourite toppings. The fun did not end here, as they decorated their own cupcakes and eat their sensational creations, just like the Year 6 girls did last week! A weekend of outdoor activities in beautiful sunshine included eating fresh produce outside that had been cooked in a pit oven. Yes, the salmon was tender and the lamb delightful! All ate well before running around the grounds burning off the necessary calories before ice creams and marshmallows were consumed with great hilarity and a lot of laughs were had around the warming campfire as the late evening sun turned crimson over the horizon. The boys and girls woke to the smells of warm bacon and wrapped up in their PJs and dressing gowns they calmly consumed their delightful full English breakfasts. The rest of the morning saw “The Battle of the ARMADAS” as the boarders were challenged to craft and design their vessels before sailing them across the channel. The scene was set as the mighty galleons commanded by able and experienced commanders to unleash their force. The tall ships faired best to start with, however it was, as in the past, the lighter vessel with the gaff rigging that won the day as the Grand Duke made an auspicious right turn before the finish line and ended up facing the concrete wall at the edge of the channel. The Spanish commander, Diego and his trusty helmsman, Bash used their superior tactics of ‘sailing straight’ to rewrite the history books as they prevailed with the wind to win the day. In the afternoon the children attended the Confirmation service at Thorpe Morieux conducted by The Right Reverend Tim Stevens, Honorary Bishop of St. Edmundsbury and Ipswich. The was occasion was very special and congratulations must go to Ben Perry, Oliver Stanton and Javier Aragon who were confirmed. Afterwards parents joined the candidates for a special Confirmation tea back at OBH. The rest of the boarders enjoyed a picnic tea which was demolished very quickly before more fun and frolics in the pool were enjoyed by all. Kenneth Grahame’s tales of the River Bank, the Open Road and The Wild Wood were all here in this vibrant musical production by Image Musical Theatre Company. We followed the lives of the loyal friends Mole, Ratty and Badger in their attempts to help the exuberant Mr Toad become a better creature. Only when Toad is threatened with the loss of Toad Hall does he realise the importance of their friendship. The cast of young professional actors were full of energy and their enthusiasm was thoroughly appreciated by the children. The show required the participation of the whole audience as the chorus who were taught several songs with actions. An additional ten children were selected by the actors to play small parts throughout the show. With realistic costumes, an ingenious set and mesmerising music by Robert Hyman this production was thoroughly enjoyed by all the children in Years 1 – 6 and we look forward to welcoming the company back again. Parents, alumni, governors, staff and pupils had a wonderful time at Mansion House, London last night. We were very privileged to have been invited by former pupil and The Rt. Hon. The Lord Mayor, Alderman Charles Bowman to host an event at this prestigious venue. Headboy, Otto Bagshaw and Headgirl, Elle Jeffrey were on duty welcoming guests as they arrived and William Cardozo, Freddie Harrison, Ella Pryke, Lily Myers, Nolly Mannion-Miles, Francis Topham-Smith, Cecilly and Fenella Jewers, Evalina Hills and Alexander Pascalides provided guests with very accomplished musical performances. The Lord Mayor, Charles Bowman gave a terrific speech about his fond memories of OBH both as a pupil and as a parent. He also outlined his achieve-ments and continued ambitions for the remainder of his time inoffice. Nick Bullen, Chair of Governors, on behalf of OBH, thanked the Lord Mayor and Lady Mayoress for allowing the school to come to the Mansion House for a very delightful evening. For all of those children attending it was a magical experience to perform in such an historic venue, and in front of so much of the wider OBH community. The changing generations of OBH were well represented – from the 1950’s to the present day, by old boys and girls, past and present governors, current and future heads and, of course, the Lord Mayor and Lady Mayoress.